Are you looking for a great deal on a used toy hauler? Fun Town is the leading toy hauler dealer in the state offering the best selection and prices on toy haulers from all brands. Toy haulers are like mini houses you can take on the road and include garages that can be used to store your favorite toys - jet skis, ATVs, kayaks, race cars, and more - or used to expand your living area. Some families use toy haulers as playrooms for their children or as in-laws quarters for larger family vacations. Toy haulers are offered as fifth wheels, which hitch into the bed of your truck and are easier to maneuver, or travel trailers, which can be lightweight and fuel efficient. Depending on the brand and floorplan you purchase toy haulers can include just the basic necessities you need for comfort or feature luxury options like king sized beds, residential appliances, and gourmet kitchens. Regardless of your lifestyle or needs we are sure to have a toy hauler that you love. 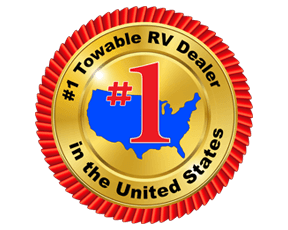 If you are having difficulty figuring out which toy hauler is right for your needs, please do not hesitate to contact us at the top RV dealer in TX and one of our friendly staff will assist you in choosing the best RV for you! Some Brands are not available at all locations. For details, contact the location nearest you.